Vermeer, an American company, has a branch almost literally in our backyard. In addition to being neighbors, they are good friends and sponsors of Shepherd’s Field. Not too long ago, the CEO and several other executives paid a visit to our campus. During their visit, our therapy team learned about a little girl named Mingyue, who is the daughter of an employee of Vermeer. 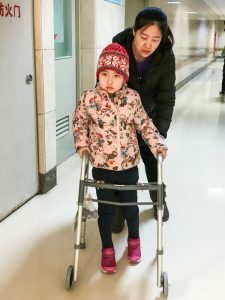 In late December, Mingyue, just seven years old, suffered a hemorrhagic stroke that left her with both severe weakness and impaired function on the left side of her body. 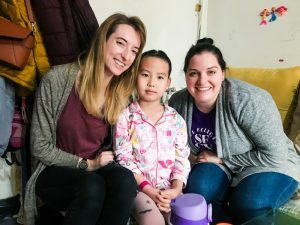 Not long after, the SFCV Therapy Team paid Mingyue and her family a visit at a rehabilitation hospital in Beijing where she was—and still is—receiving therapy treatments. 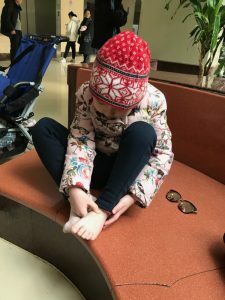 During their initial visit, our team observed that she had minimal use of her left arm and hand and that she was unable to actively move her left leg or foot. Working in collaboration with the hospital therapist on-site, our team was able to provide a few additional therapeutic recommendations for how Mingyue could begin to incorporate her left side in her activities of daily living and how she could increase overall strength on the affected side. Mingyue made significant progress very quickly. Just six weeks after her stroke, she was able to stand and walk using a walker! Her physical abilities, the use of her left side, dressing and other daily life skills have all improved. Our team has had the opportunity to visit her several times and to provide her with therapy supplies and equipment, and they plan to see her again after she is released from the hospital. We’re so delighted to have this opportunity to reach out to one of our neighbors and to be a part of this precious little girl’s journey toward recovery. If you would like to make a difference in a child’s life, donate here and choose medical fund.